This New Year, 2019, follows on immediately from an exciting year in 2018 with the Chinese Chang'e-4 lander and rover landing successfully on the far side of the Moon. In terms of planetary sciences, much was accomplished last year. The New Horizons mission has sent images of one of the most primitive bodies in the Solar System, Ultima Thule (in the Kuiper belt). NASA's OSIRIS-REx found spectral signatures of hydrated minerals indicating the presence of water on the asteroid Bennu. And on Mars, data was published documenting the presence of a lake buried under 4.5 km ice at the south pole – reminiscent of the buried lakes on Antarctica (full of interesting extremophiles!). Insight (NASA/CNES) touched down gently in Elysium Planitia, sending back images of the deployment of the first seismometer on the red planet. Exciting new information on the planet's interior and other planetary processes is eagerly awaited from this mission. Importantly, final landing sites on Mars were chosen for the European/Russian ExoMars 2020 mission (Oxia Planum) and the NASA Mars 2020 mission (Jezero Crater). Oxia Planum, ~3.8 Ga, at the edge of Chryse Planitia, is characterised by layered sequences rich in water-formed clays and has fluvial/deltaic features. Jezero Crater, ~3.9-3.5 Ga, at the edge of Syrtis Major, contains lake sediments incised by a fluvial delta. Both missions will be launched in July/August 2020. ...and then I started trying to read up on ALL aspects of astrobiology in 2018 ... and realised this was an impossible task. So much research, so many exciting discoveries! So I apologise for the limited "taster" and salute the many researchers advancing our understanding of habitability, the origins of life, extreme life, exolife, analogues of all kinds and all associated philosophical and societal aspects. 2019 dawns with many prospects in store. Work is ramping up towards launch of the two astrobiology missions to Mars. Hayabusa2, a JAXA mission to study the origin and evolution of the solar system as well as materials for life, is hovering over the C-type asteroid Ryugu and will soon land to make in situ investigations and takes samples for sample return. Exoplanet study will soon have a new tool, CHEOPS, which will be launched towards the end of the year. And so many new and on-going astrobiology related projects are flourishing. I look forward to welcoming you all to the EANA meeting, 3-6th September in Orléans, France, where you will be able to present your latest exciting research, enjoy deep scientific exchange, and have the chance to visit the cultural heart of France (also home of the Nançay radiotelescope that we will be visiting). The National Space Science Center of the Chinese Academy of Sciences and the Space Studies Board of U.S. National Academies of Sciences, Engineering, and Medicine to invite applications to participate in the 9th and 10th Forums for New Leaders in Space Science. The Forums, initiated in 2014, are designed to provide opportunities for a highly select group of young space and Earth scientists to discuss their research activities in an intimate and collegial environment. The 9th and 10th Forums will be devoted to Earth observation from space and planetary science (i.e., studies of the solar system's planets, satellites, and minor bodies) and will be held on 15-16 May 2019 (in Beijing, China) and 28-29 October 2019 (in Washington, DC). Application deadline is 31 January 2019. The NASA Astrobiology Program has announced a new programmatic infrastructure. Known as Research Coordination Networks (RCNs), and first deployed as the Nexus for Exoplanet System Science (NExSS), RCNs bring together researchers who are funded from a variety of sources into interdisciplinary, topically-focused research groups. By early 2020, the NASA Astrobiology Program will have activated five RCNs -- four new ones plus NExSS -- each organized around a key research topic identified in the 2015 Astrobiology Strategy: prebiotic chemistry and the early Earth; early metabolism, evolution, and complexity; life detection on other worlds; habitable worlds (initially focused on ocean worlds); and exoplanet system science. This document contains answers to Frequently Asked Questions about the Astrobiology Program organized by topical areas. BIOMEX (BIOlogy and Mars EXperiment) is an ESA/Roscosmos space exposure experiment housed within the exposure facility EXPOSE-R2 outside the Zvezda module on the International Space Station (ISS). The design of the multiuser facility supports—among others—the BIOMEX investigations into the stability and level of degradation of space-exposed biosignatures such as pigments, secondary metabolites, and cell surfaces in contact with a terrestrial and Mars analog mineral environment. 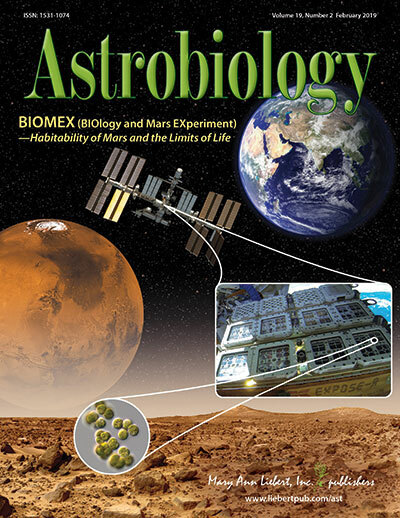 In parallel, analysis on the viability of the investigated organisms has provided relevant data for evaluation of the habitability of Mars, for the limits of life, and for the likelihood of an interplanetary transfer of life (theory of lithopanspermia). In this project, lichens, archaea, bacteria, cyanobacteria, snow/permafrost algae, meristematic black fungi, and bryophytes from alpine and polar habitats were embedded, grown, and cultured on a mixture of martian and lunar regolith analogs or other terrestrial minerals. The organisms and regolith analogs and terrestrial mineral mixtures were then exposed to space and to simulated Mars-like conditions by way of the EXPOSE-R2 facility. In this special issue, we present the first set of data obtained in reference to our investigation into the habitability of Mars and limits of life. This project was initiated and implemented by the BIOMEX group, an international and interdisciplinary consortium of 30 institutes in 12 countries on 3 continents. Preflight tests for sample selection, results from ground-based simulation experiments, and the space experiments themselves are presented and include a complete overview of the scientific processes required for this space experiment and postflight analysis. The presented BIOMEX concept could be scaled up to future exposure experiments on the Moon and will serve as a pretest in low Earth orbit. VAAM WG Space Microbiology Workshop "Space Microbiology meets Omics"
Eds. : Barbara Cavalazzi and Frances Westall, Springer (2019). Committee to Review the MEPAG Report on Mars Special Regions, The National Academies Press (September 2015).